My recent post about Louth Contemporary Music Society's new CD of Tavener, Pärt, Knaifel, Silvestrov, Cage and Górecki attracted a lot of attention. One of the founders of LCMS, Eamonn Quinn, noticed that my Jordi Savall podcast uses Steve Reich's Nagoya Guitars as a signature tune; so he sent me an interesting CD of contemporary guitar music from Ireland. 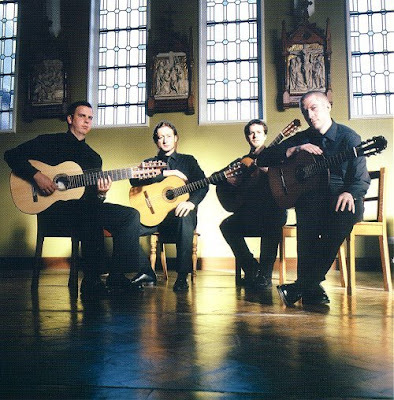 The Dublin Guitar Quartet, seen in my lower photo, play eight-string and eleven string guitars. The extended range of these instruments allows them to specialise in arrangements of contemporary music, and their repertoire includes transcriptions of Philip Glass' First and Third String Quartets. Their CD Deleted Pieces , which Eamonn Quinn sent me, includes a very striking arrangement by quartet member Brian Bolger of the second movement of Henryk Górecki's Quasi Una Fantasia String Quartet No. 2, a work originally commissioned by the Kronos Quartet. Other composers on the CD are Kevin Volans, Dublin rock band Redneck Manifesto, Brian Bolger and Leo Brouwer. Deleted Pieces was originally released in 2005 by Greyslate Records and my header image is the cover artwork for the disc. This, I think, shows the recording venue of the Church of ss. 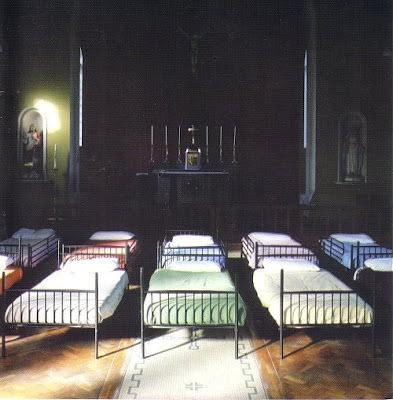 Cuan and Brogán, Clonea Co. Waterford, but don't ask about the beds. And yes, the album title and artists are missing. They were added via a self-adhesive sticker on the jewel box. Deleted pieces somewhere in the production process perhaps. Deleted Pieces is now available via iTunes, the quartets MySpace site, from Road Records and from a number of aggregate down loadsites. * Henryk Górecki's Symphony No. 4 is being given its world premiere by Marin Alsop and the London Philharmonic Orchestra on April 17, 2010 in the Royal Festival Hall, London. The programme also includes the European premiere of Philip Glass' The Four Seasons and a first performance of a new work by Marc-Anthony Turnage. Back in 1993 Nonesuch's recording of Gorecki's Third Symphony entered the top ten of the British pop charts and was a classical bestseller. So who will record this new symphony? That mention of Gorecki's Third Symphony can only point to Is classical music too fast? Thanks, pliable, for more fascinating posts. I imagine that several of your readers will recall which major label first recorded Witold Lutoslawski’s Symphony #4. From the same link, I see that David Murphy will be conducting the world premiere of Ravi Shankar’s Symphony, in London, next June. PS. Is Henryk Gorecki’s Symphony #2 getting as little airplay in the UK as I imagine it is getting in the US (and Washington) this historic anniversary week?